Today at The Digital Factory, Formlabs announced two new product lines, both years in the making. We’re excited to introduce the Fuse 1, a 3D printer that brings the industrial power of selective laser sintering (SLS) to the benchtop, and Form Cell, our automated 3D printing solution for manufacturing powered by the Form 2. This marks a major step for Formlabs as we strive to put the means of production in the hands of as many businesses as possible. The equipment necessary to create has become so large scale and expensive that it’s concentrated the ability to manufacture in fewer and fewer hands. 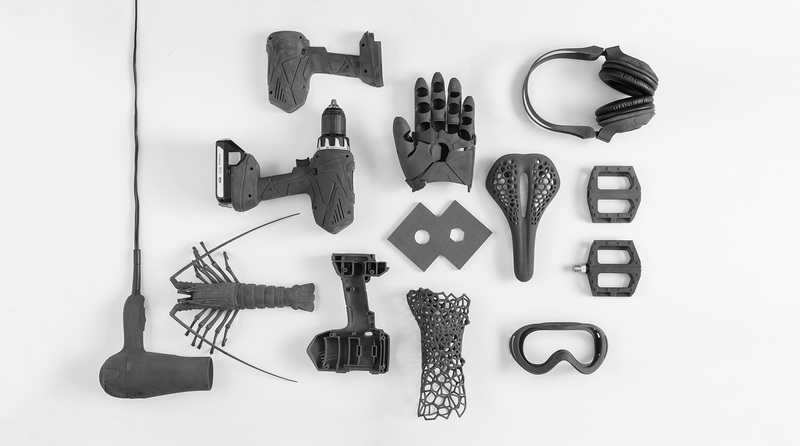 It’s time to make a change.How can we bring humans back to the manufacturing process to make the things we actually need, closer to the spaces where they’re designed? How can we make the prohibitively expensive technology used for high-fidelity prototyping and end-use production available to a wider segment of society? Additive manufacturing is already in wide use across numerous applications, but typically, engineers and designers turn to this technology for one-off prototypes and low-volume production: 1, 10, 1,000 parts. 3D printing has proven its efficacy for higher volume production in limited cases. Invisalign produces clear dental aligners in quantities of tens of millions per year with the aid of stereolithography machines, and custom hearing aids produced using 3D printing fit better and sound better than ready-made alternatives. What’s preventing 3D printing from being used for even more high-volume applications? Why isn’t the same technology used to produce custom hearing aids also used to produce consumer products like earbuds? What’s Next for 3D Printing? There are two main barriers to 3D printing expanding into wider applications: materials and cost per part. We believe that many more examples of 3D printing for production will emerge if 3D printer manufacturers can push improvements in these two categories. We’re proud to be part of an industry that never stops pushing boundaries around what types of products additive manufacturing is capable of making. If the 3D printing industry has stagnated, it’s not for lack of effort developing innovative materials. It’s for lack of progress on the second part of the puzzle: cost per part. Before we can make real progress on cost per part, we need to break down what actually goes into making each part and drive every part of this down. With the launch of the Fuse 1 and Form Cell, Formlabs is attacking the cost per part equation from every angle. Fuse 1 brings down equipment ownership costs for selective laser sintering, a prohibitively expensive technology that uses a material, nylon, that’s both strong and cost-friendly. Form Cell takes on the oft-neglected labor component, automating repetitive 3D printing processes so that labor can be redirected to more creative and impactful tasks. Formlabs has already made a lot of progress on equipment ownership cost: the Form 2, the best-selling stereolithography (SLA) 3D printer on the market, is as capable as more expensive systems at a fraction of the price. With the Fuse 1, we’re doing what we did for SLA for selective laser sintering (SLS). SLS uses a laser to fuse a powdered material into robust nylon parts. Introducing the Fuse 1: The industrial power of selective laser sintering on your benchtop.SLS is already a popular 3D printing technology today, used to print a range of items like spare truck parts and custom clothing. Nylon is loved by engineers for its strong, flexible properties. The SLS process itself has some great benefits, too. Parts are suspended in a bed of powder as they print, so prints don’t require any supports, which opens up broad possibilities for complex, intricate parts. With Fuse 1, you can print with up to 50 percent recycled powder, which helps bring cost per part down. Nylon is loved by engineers for its strong, flexible properties and resistance to wear. Until now, however, SLS 3D printers have been prohibitively costly for most businesses, with a single machine running over $200,000 and requiring its own devoted space and specialized infrastructure. All of the SLS parts in use today were printed on these expensive commercial machines or through service bureaus, taking production out of the hands of most businesses. With the Fuse 1, we’re excited to bring the industrial power of SLS to the benchtop, starting at $9,999. We’re accepting reservations for the Fuse 1 now, with the first beta units shipping late 2017. Companies like Invisalign who’ve pushed 3D printing into higher production volumes have largely done so because they’ve been able to automate the most repetitive parts of the 3D printing process. A 3D printer isn’t a magical black box that spits out a pristine part at the push of a button, and not enough has been done to decrease labor costs in 3D printing. We developed Form Cell to address this gap, providing an automated 3D printing solution that leverages the Form 2, our desktop 3D printer with stability and reliability proven through tens of millions of prints in the field. Introducing Form Cell: Production automation for stereolithography (SLA) 3D printing, powered by the Form 2.Form Cell is a scaleable cell of 3D printers that parallelizes and automates repetitive 3D printing processes, enabling a true 24-hour digital factory. The system includes a row of Form 2 3D printers, a post-processing solution, and an industrial robotic gantry system, plus software to optimize print scheduling and API endpoints for industry standard business systems and homegrown systems alike. Because the Form Cell is built around affordable hardware, it’s possible to prove ROI in months, rather than years. If your company could benefit from automating small batch manufacturing, we’re ready to work together to develop your tailored solution. A scalable cell of 3D printers that parallelizes and automates repetitive processes. Complete work cell from file to finished part. A row of Form 2 3D printers, Form Wash, and an industrial robotic gantry system. Proven track record. Scale production with the Form 2, the best-selling SLA print engine that’s already stood the test of printing more than 10 million parts. Reduced labor through smarter software. Print job scheduling, remote monitoring, and part and serial number printing. Factory ready. API endpoints for integration with industry-standard business systems (CRM, ERP, MES) or your homegrown systems so Form Cell can be part of your existing workflow. Optimized for the lowest cost per part. Prove ROI in months instead of years. True lights-out manufacturing. Optimize part creation and reduce downtime with reliable, stable printing, no check-ins required. Less labor, more time. Eliminate the most repetitive parts of the 3D printing process so people can focus on higher-value tasks. Affordable cellular manufacturing. Form Cell is designed to be affordably customized for every business. Every Form Cell setup is unique. Work with us to design the system that fits your application and needs. If your company could benefit from automating small batch manufacturing, let’s work together to develop a tailored solution. Yes, I want all information about the Formlabs products now !